Wool socks and velcro tevas. There is salt in every corner of my cheap Casio watch. The airport terminal is busy and loud in a way that is beyond comprehension when you come from being on the ocean, far from land. It is not to say that out there it was not loud, or that it was not busy. It is the busy of ultimate wilderness. I recall my first passage down the North Atlantic. When I need to calm myself I think of those vast vast swells from the east rolling over from Africa, the water looking like mercury in the moonlight. The wave height so tremendous, and the wave period so long and consistent, it looked as though the whole of Earth's heart was beating, and I could see it. Every bit of it was alive. Home on the pier in the summertime, I find great pleasure in drinking lots of espresso in the morning and checking my wind apps, watching the sky. I enjoy being observant of these things. I am coming to understand that this is a fortunate way to be. Daily looking skyward for my information, less so into a tablet. Sailing is most about observation of elements and timely response to them. It is a dance of balance and form. When the wind fills the sails on a port tack, head to wind, I am sailing to the luff of the topsail. It is in the light quiver of the belly of this sail that I know the other headsails forward of the mast and our mainsail are fully powered. As we reach the approaching shoreline I start to play through our tack in my head. Are we getting lifted, or are we getting headed? I feather Frances as close to the wind as possible with as little variation to the rudder as can be managed. With a neutral rudder and good hull speed I throw the helm to port, forcing the bow through the wind and start to spin the helm back as soon as I sense we have won the new tack. I write all of this in response to a question I never know how to answer well. I get asked if I get bored of my work, if I get bored of the sailing. Usually the question surfaces on a light wind day. My answer, without question, is never. It is that we, none of us know, what is just around the corner. The nature of sailing is to be constantly adjusting so when change does come you are in a good position to receive it. It is a beautiful way to live, on this living breathing body of water beneath our hull. A long answer to an easy truth. 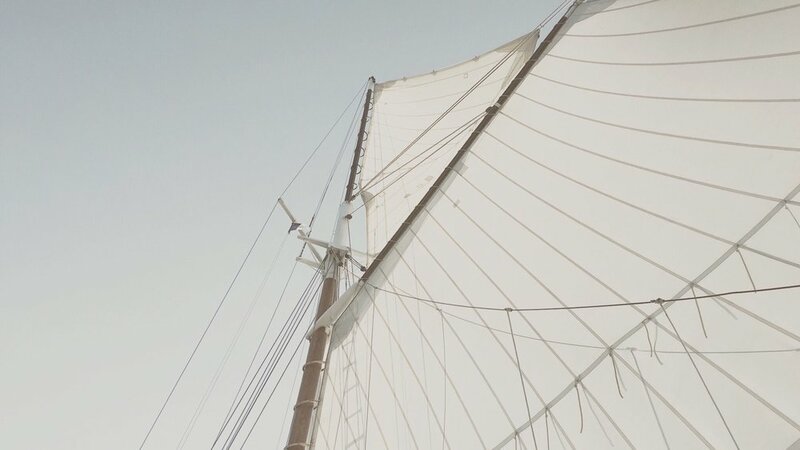 To understand why we sail is to understand where we came from. On a cold December day, with a storm that brought wind from the east, I drove my rusty old Saab up onto the Vinalhaven ferry. Time would reveal that this would be the last vessel to run for a couple of days. On island was where we would pace through the weather. That day, driving up the coast, I had the excitement that can only be brought by anticipation of seeing a place for the first time. The island is enchanting. Summer, winter. The friend I traveled with had grown up there. We scraped the sea ice off the windshield and headlights when we reached the other side and made our way into the town for provisions. On our way out to the point we stopped by his friend's boat shop, an older man who had spent a lifetime mastering the skill of building traditional Maine peapods. Out of the little gold car popped two messes of sandy blonde hair, a set of sea green eyes and a set of the darkest of brown eyes. Phil Dyer had known Hasket since he was a child. They were two of a kind, both boat builders. Hasket introduced me as his new sailor friend, and we spent the next couple of hours admiring Phil's projects, his drawings, his beautiful hand tools he used for his craft. After the visit we carried on to the point to make dinner. By the late hours of the evening the profile of a sailing hull had been drawn. Hasket continued to work into the early hours of the morning as I slept. Thick lead pencils and any sort of paper he could find. A set of ships curves found in a drawer, straight strips of kindling used for battens. This was the first time I was introduced to Frances. The first mathematical form of her was born on this island. It is truth that Hasket appreciated the look of the boat as young as the age of eight. The earliest dated piece of her is a painting he did when he was just this age. As a teenager, as a young man, he continued to draw her in sketchbooks, on scrap paper. She was in his dreams. He would position his life and his time in such a way that he would learn how to build her. That Frances has massive historic significance on the Portland waterfront is without question. She is built in the spirit of working vessels that would have sailed out of Portland Harbor between 1790 and 1820. Her design precedes the schooner, or any sort of pleasure yacht for that matter. She is British inspired and her gaff cutter rig very impressive off the water. She represents a time when there would have been a hundred vessels like her anchored in our protected harbor. She is a very special piece of our landscape in this time. This vessel may have been forgotten to Portland if it were not for this young boat builder and his connection to the past. Hasket Derby Hildreth was named for his forefather Elias Hasket Derby of Salem, Massachusetts. Elias Hasket was born in 1739. The Derby family owned privateers, grand sleek gun carrying ships. In times of war these vessels would overtake and seize foreign enemy trading ships and any other ship of war. The Grand Turk, the Derby privateer, was most successful at this; between 1791 and 1792 she gained seventeen prizes before the Revolutionary War was over. These privateers, including the 300 gross ton Grand Turk, were outfitted as sea going cargo vessels after the war. The Grand Turk became the first New England vessel to trade directly with China. The Derby's have salt for roots. Hasket had a true connection with self that I will always admire. He paid homage to his dreams. This vessel is a reminder to us all to stay true to our own. I would have never guessed that I would have the good fortune to work in this space again. The morning light through the old glass windowpanes, all these years and it still stops me in my tracks. You would know it if you've been here. A silent giant on our waterfront. Inside the pale blue brick walls of the Portland Company I was once again no longer a visitor. Before this beautiful building falls to the earth where it once rose, our crew was granted a short lease to build out a rigging shop and a wood working shop in the winter of 2017. It is in this very space, just a couple doors down, that the hull of Frances was constructed. On a bright February morning we moved in and started to unpack. Bandsaw, tablesaw, paints and epoxies. We built a pedestal for our rigging vice, a sturdy working platform for splicing wire. We had a couple workbenches, we built more. It is here that we completed all of the wire splicing, service, and leathering of the upper portion of the standing rigging. In these winter months a new topmast and bowsprit were also built. To properly build wire rope standing rigging, first one has to have a good handle on overall length, namely the length that is assumed by putting an eye in the wire and by tapering in a splice. Then one needs new wire stock, in our case spools and spools of 7X7 wire rope varying from 1/2 inch for lower rigging to 1/4 inch for rigging set aloft. All galvanized wire for shrouds, and all stainless wire for stays running forward. The head-rig was outfitted with all galvanized wire. Hundreds and hundreds and hundreds of feet of wire rope were ordered. Next we had to devise a process for the worming, parceling, and service of our new rigging. Worming proved to not be necessary for the size wire we were using, the parceling was good enough to fill in the voids formed by the lay of the wire strands. A wrapping of friction tape (parcel), an oiling with linseed oil, and a wrapping of tight service was first applied in a short run before the wire was wrapped around the thimble. Similarly in the case of the large eye splices that set around the mainmast and hounds, parceling, service, and leathering were all completed before the splicing began. After the splicing came the pounding to flatten the long taper, followed by the stainless steel wire service. Over the wire service was the parcel and the tarred service. This entire process was completed a second time for the lower parts of the rigging after the mast had been stepped. By this time it was spring, and there was a bit more urgency as there could be very little error in splice length or the mast would need to come down. The goal was to have symmetrical rigging with symmetrical turnbuckles set with generous room for adjustment as the wire would and will stretch over time. Completed in May of 2017, there was little to no error in what was built. 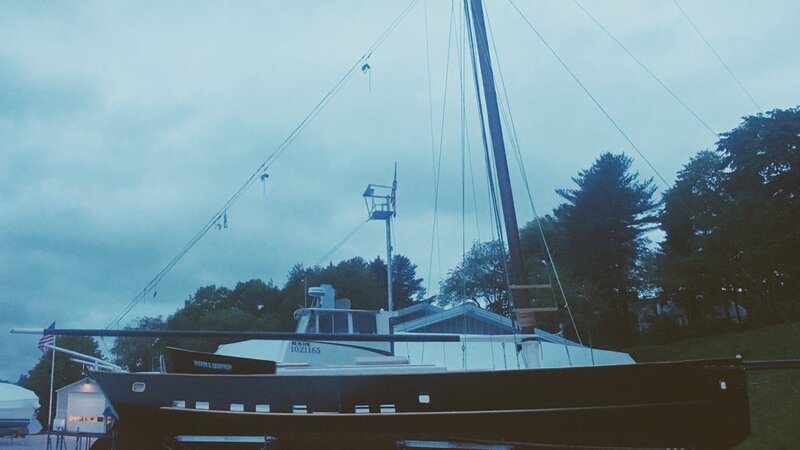 A new solid laminated spruce topmast, beautifully tapered, as well as a new solid laminated spruce bowsprit were added to Frances, and shipped in place before the final splicing came to be. The arrangement of this work in its completion was truly one of the proudest moments this vessel has ever seen. Thank you Jeffrey, Rory, Sarah, Frances and Colby. Always. It's a photo reel, enjoy. I am writing to follow up on our previous March post; A Letter to the Islands. Here in the city of Portland we are happily settling into spring weather. Yard period has begun and Frances will be sailing in June. I am pleased to say that we have managed to find success in our vegetable delivery project, and that we will be offering our service to Peaks Island residents this summer. I encourage you to do so as soon as possible as they have received a tremendous amount of interest this spring. I am pleased for them, and excited for us! We will be able to offer this service for summer shares only. July 5 - August 29. When registering choose the pick up location for Peaks Island. Deliveries will be on Wednesday afternoons between 1 and 2PM. In purchasing a share it must be understood that receiving the delivery will be necessary. Frances will be docking at the Trefethen in Diamond Pass. On a final note, I wanted to relay that this delivery has no charge. This is a project that myself and my crew want to take on in an effort to contribute something to our community. Frances would have been a cargo vessel in her day. I think it quite practical that she, and we, connect to our roots a bit. The boat comes out of the water, lifted from above. Airborne but steady, she is cradled by slings, wheeled forward from water to land by the lift that hoists her. Her belly is wide and flat and red, freckled with algae. De-rigged and mastless, stripped of her billowy white sails, she is nearly all steel but not without grace. Her bowsprit juts forward as if her neck is craned, back arched, looking ahead. A wingless bird. Megan Jones looks on, hands tucked into the back pockets of her jeans. She is focused and alert but smiles often with ease. Her chestnut hair is wrapped in a loose knot at her neck. She wears no makeup and is beautiful. This boat, the Frances, is hers. The steel hull drips with salt water, puddles forming under her keel and rudder. A man in orange rubber overalls starts power-washing specks of sea life from the hull. It is October, and the sailing season in Maine is over. The boat is returning to land where she will hibernate patiently through the winter, propped on stilts, wrapped tightly in a cocoon of white plastic. At forty, Hasket Derby Hildreth was all coarse blonde hair, smiling green eyes, and charm. He was wild in the best sense of the word: free, driven, passionate. He’d grown up on Maine’s coast with his parents and three brothers and was named for Elias Hasket Derby, a merchant and shipowner of the mid-1700s. Hasket avoided burning fossil fuels, ate local organic food, and exuded natural brilliance and eccentricity. His environmental consciousness and intelligence about food made people say he was of the earth, but truly he was of the water. The Frances was the second boat Hasket would build with Wally Soule, an old friend and master woodworker. From four years old, the two spent their boyhood summers on boats. A carpenter, Wally built houses but also knew steel from working as a bridge builder across New England. Why Hasket wanted to build a boat that would take black-soled New York vacationers on tours of Casco Bay—and be subjected to answering their ding-ding questions about sailing—was beyond Wally. But there was no hesitation in joining the project. Hasket had a vision for a unique vessel; Wally had been there to build the first boat, and he’d be there for the Frances, too. At the sail loft, she met Hasket. He arrived like a ship, full of presence, filling the moment with warmth. She connected with the old soul she saw in him, feeling that it echoed her own. He was of another time. Megan was captivated. They would spend the next two years together, sailing. The coastal sailing Megan knew with her family was not the sailing she came to know with Hasket. With Hasket, she took her first long sailing trips, lived aboard the boat, sailed night and day. One October on Hasket’s 35-foot sloop Alina, they set a course, analyzed the tides, provisioned food and clothes, and set out from Portland through the Cape Cod Canal down to Newport, RI. They left at night, in the cold dark, because the weather was right, and Hasket knew what the wind and sea spoke, and knew when to leave. It was the first time Megan stood a watch, alone on deck at the helm while Hasket slept. She drove the ship, kept course, and corresponded with other boats. Her heart swelled with adventure and life. They were in love. They would build a boat. Hasket set up a drafting table at his home in South Portland and spent months stationed there drawing and calculating. Using ship curves, he penciled swooping lines from bow to stern, masthead to keel. Hasket was naturally brilliant, held a degree in engineering, and had gone to boat-building school. But he was also dyslexic, and calculations required intense concentration and review by Megan. When the plans for the boat were approved by the Coast Guard, Hasket radiated with youthful pride. It was the second year of their relationship, and Megan was living with him. The couple had a dog, a Jack Russell named Duff. A new energy ignited within Hasket while he was planning the Frances. Megan witnessed something come alive in him; he was full of an artist’s intensity and focus. It seemed that maybe Hasket was slipping away from her. Maybe his passion was something with which she could not compete. And maybe, if she looked inward, she saw that she was still so young, just out of college, and in a relationship with a man much older, a man who already had a daughter—and who, maybe, did not seem capable of settling down, even now. Perhaps, for Hasket, building the boat was not only about the desire to design and build and start a company but also about the lure of the sea and its constant motion, its endless passageways. Three months before construction began, in the cold of winter, Megan grew sick. Fever and nausea came and went for weeks. Finally, when she arrived at the hospital, the doctor told her that her appendix had abscessed weeks ago; it was collecting bacteria and spreading infection inside her. He did not know how she was still alive. She was rushed into surgery. Days later, she couldn’t break her fever, returned to the hospital, and underwent a second operation, this time spending weeks there. In nearly two years, it was the first time Megan’s and Hasket’s parents were in the same place at the same time. Hasket’s mom asked him what he thought he was doing with this young girl; there was nearly twenty years between them. Everything wrong finally demanded attention and could not be ignored. The romance ended. But the boat project had been planned for months, and Megan wanted it. It was an opportunity to learn and to be part of something. This was her plan, too, and she would not let go of it now. Hasket, Megan, and Wally began building in February in a warehouse by the water—building #7 of the old Portland Company complex. In the mornings, around seven, Hasket would pull up to the shop in his car, and Wally would arrive in his. The sun at its morning slant filled the still world with orange and illuminated the sparkling frost. Megan would arrive and let Duff play outside before starting work; she’d taken ownership of the dog when the relationship ended. The men would sit separately reading the paper in their cars: Hasket, The Wall Street Journal or The New York Times, and Wally, The Portland Press Herald. When Hasket opened his door, Wally followed suit, and they would go inside and begin building. The vast, echoing warehouse where the construction of Frances took place was dark and dirty and without heat. Wally and Hasket constructed a flame-retardant wall before welding could begin. Eight-by-five sheets of raw steel arrived: thick, heavy metal—unrefined and brown. They built an I-beam crane to move the steel, along with other tools, using brake presses and large steel benders to curve the pieces and shape the hull. Hasket’s vision was to build the Frances in the style of schooners used for fishing and local trade that flourished at the turn of the 19th century along Maine’s coast. In the mid-1800s, boat building in Maine grew, along with the demand for trade of larger quantities. Two-, three-, and four-masted schooners became popular and were known for the speed at which they could slice through the treacherous waters around Cape Horn and the Cape of Good Hope. But with the advent of railways and steam engines, the age of the schooner for trade ended. By the 1930s, schooners were repurposed as windjammers, used for pleasure cruising. Frances would be an engineless sloop, the type of sailboat where one mast bears the mainsail, and the traditional 70-75 feet in length. Her hull would be steel, resilient and durable. She would have a push-boat to steer her on and off the dock instead of a diesel engine. A traditionalist, Hasket sought to reincarnate the legacy of Maine’s windjammers with Frances. They worked eight-hour days, starting early and finishing up in the late afternoon. South Portland’s 98.9 WCLZ played alternative and classic rock in the shop, shallow hums between the movement and noise of metal. The steel and the tools required to move, bend, and weld it loomed like cold beasts in Megan’s new world, unfamiliar and intimidating. Her first job was to use a plasma cutter to cut pad eyes from the metal that could be welded to the sheets as a way to move the heavy slabs. Once they were welded on like handles, ropes were pulled through, and the steel could be lifted by crane. With each task, she worked seriously, proving herself. The floor became slick with water from rain and melting snow. Since she was the smallest, Megan often welded the bottom of the hull, crouched down low. She wore layers of old clothing, flecks of metal embedding themselves in the cotton. More than once, while she knelt on the damp floor, the welder sent a shock of electricity through her. She wore gloves up to her elbows, gripped tighter, leaned in, and kept working. At the end of the day, in a hot shower, soot would pool at her feet, washed from her hair and skin. Tissues turned black when she blew her nose, despite wearing a respirator all day. Her knees and back ached from squatting, lifting, and kneeling. While her classmates from Bates worked office jobs or backpacked through Europe, Megan built a boat. Hasket orchestrated each task, giving direction, Wally and Megan following. If working each day with Hasket was an emotional strain for Megan, she tried not to show it. It was not easy joining this team: Hasket and Wally had a lifelong friendship and had already built a boat together; Megan was a novice, a woman, and years younger. Hasket, in impatience or frustration, was not always kind. The two had moments, times when he was hard on her, an argument sparked, and Megan left. But within hours he would call—Come back, we need you—and the project continued with three. They realized if they were going to finish building the boat, if they were going to start a day sail company, they needed each other. Hasket needed Megan to hold up the business end, and she needed him to bring the boat to life. With time, their love settled into a loyal friendship. The months passed from April to May to June, and the weather began to warm. As the hull took shape, the warehouse building seemed to grow smaller: it was twenty feet wide; the hull was eighteen. But it went smoothly—slow and steady. Hasket’s meticulous calculations were spot-on; when the hull was completed in October, the amount of excess material left in the shop fit in the bed of his truck. Hasket saw the boat in his dreams. Wally understood through Hasket’s drawings. Megan had seen the sketches, but the day the boat come out of the damp, dark shop and out into the sunlight, she was seeing the thing, really seeing it, for the first time. The Frances was immense and elegant. Hasket named the boat after his daughter. Dozens of family and friends came, and people walking by stopped to see Frances go into the water for the first time. Her cabins were empty; she was all shell. The boat floated like a leaf atop the water. Hasket called her perfect. Over the winter and into the next spring, Frances filled out and softened with oak and spruce. Hasket, Wally, and Megan worked to build the mast and bowsprit, her cabinhouse, lazarette hatch. They built the push boat, affectionately christened “Pushy.” Sails were stitched; Frances was rigged. By summer, she went out for her first sails. Megan and Hasket made preparations to start their day sail business the next summer. They would call it Maine Sailing Adventures. Frances was ready for passengers. Hasket swelled with pride seeing the boat he dreamed into life become part of the Portland waterfront. They sailed the boat three times every day all summer long, sharing the beauty of Casco Bay with her passengers, young and old, from Maine and from away. To hoist Frances’ sails and drive her through the bay, Hasket and Megan needed a crew. They hired some crewmembers who had never sailed before and taught them how to run a boat, making it fun. Frances became their summer home—more like a place to gather with friends than a job. Deckhands returned year after year, bringing their siblings, too, working together like swallows. The bonds between crew made the boat a success. They became a family. Megan and Hasket worked together each day from May through October, dedicating themselves to the success of the Frances. Their relationship was at once strained and stable, grounded in trust and commitment but tested by the stress of running a fledgling business. Their personal lives weaved in and out of the constant of sailing. They dated other people. Megan was in a serious relationship and living with her boyfriend. Megan remained Hasket’s confidante, meeting him for coffee if he wanted to talk, listening to his thoughts and ideas. In stress or anxiety, coming back to the boat was what grounded him, but running a business did not provide the same creative outlet as designing and building did. Eventually, Hasket started drawing up plans for another boat. He wanted to build something bigger than Frances, a vessel that would be seaworthy—one that could sail beyond the waters of Casco Bay and could make passage at sea. But the plans never came to life. Megan stands in the Portland Company building for the second time in a matter of days. It’s early March, the day of the spring boat show, and by some mystery, some inexplicable madness, she is here at the Maine Sailing Adventures table without Hasket, and Hasket will not be here again, will never stand here with her on this day, not next spring or the one after. And her chest has ached for days; it feels at once crushed and hollow. Waves of excruciating impossibility and quiet numbness pass over and over, tides of grief, moons of emptiness, beginnings and ends and ends. Hasket’s brother called days earlier on a cold February morning. Megan was skiing with her boyfriend and could not get reception on her phone at the top of the mountain. They always went skiing during blizzards when the snow was new and rich. Under the gray sky, through the white powder, she skied to the bottom, wind in her face, and called him back. Hasket was gone, he told her. He passed away last night. It was sudden. The snow fell all around her. Now she stands at the boat show, just days after his memorial service was held in this building, in this same spot. In a twist of universes, a folding inside out of fate, she is here again but in a different condition and with a new purpose. Hasket’s mom has painted a sign that reads Maine Sailing Adventures and shows the boat as it was sketched by Hasket early on, his penciled strokes peeking out from under her soft lines of paint. People smile gently, nod knowingly. Megan breathes. Frances becomes a church. In the following weeks, the routine readying of the boat for the summer sailing season transforms into a ritual of togetherness in remembering Hasket. Friends and family come to help, pray, bring gifts, tell stories. Frances is made anew: the floor is ripped up; they disassemble the interior, remove rust from inside the bilge and hull, the main salon, the lazarette, the forward galley—remove, recover, reseal, repaint, reassemble. By June, Frances returns to the water. Family and friends take her out into the bay in the quiet fog to scatter Hasket’s ashes. They release into the air, fluttering softly like feathers, settling gently in the black water. The fog lifts. Megan carried the business that summer, the weight of responsibility at once unbearable and yet the catalyst to her healing. Each morning, she came to the boat, went through the motions, and worked and worked. She captained the boat more than ever before. For the first time, she was consistently responsible for sailing the Frances on her own, for making decisions, and for managing the safety of the boat’s passengers. Frances cooperated. There were times when the boat sailed so smoothly it was as if she knew. She sailed slowly—balanced and deliberate. In moments when Megan stepped away from the helm, Frances continued to sail straight. One year trickles into the next. Slowly, the dull ache and sharp pangs of grief begin to fade, and the delirious fog of anguish that seemed to hang over everything dissolves. Megan works twelve- and fourteen-hour days. She goes down to the pier shed to open up for the day by 8:30 am. She spends mornings on the phone, responding to emails, talking to potential charter clients, and selling tickets. The crew arrives at eleven, and they wash down the boat and provision for the day. The first sail leaves at noon. Depending on the day, Megan captains, crews, or stays shoreside. She plans catering and hires a bluegrass band to play during sunset sails. She organizes educational sails for school field trips and junior yacht clubs. She arranges Coast Guard inspections and licensing through the city and state. She is responsible for hiring crew and for their payroll. She does the accounting, taxes, invoicing, marketing, and advertising. She maintains the website. In the wind and sun, passengers cluster around the Maine Sailing Adventures shed waiting to board. Megan greets the guests, checks them in, and answers questions. Conversation rises like a song amidst the sound of the wind and gulls. The harbor surf is rough and choppy, lapping against the boarding dock persistently, splashing over, retreating, leaving patterns of damp peaks and valleys on the wood. Frances’ port side bumps against the rubber buffer of the dock, squealing and groaning rhythmically with the friction of each lurch. Everyone boards. Leaving the dock, the deckhands move to their stations on either side of the mast, ready to pull up the mainsail. Megan helps, laughing with the crew as they go. The captain gives his cue, and it is like a race—hands fly up one over the other, yanking the rope down, bringing the sail up, quickly, steadily, using bodyweight to reach, pull, reach, pull. The jib is set free and it too inflates with air. The deckhands smile with flushed faces. Suddenly, Frances is sailing. Megan does this every day from June 1st through October 15th and spends the rest of October and November winterizing Frances, then works through April and May readying the boat for the next season: rigging, resurfacing, revarnishing, grinding, painting, taking apart and putting together. The plumbing needs to be redone. The rot in the mast needs to be carved out and repaired. Wally wants to replace it with an aluminum one, but Megan isn’t sure. What would Hasket say of aluminum on his traditional sloop? The pages of the calendar fall away. The Frances is a living creature. Sometimes she is unrelenting in her neediness; other times being aboard her is like spending time with an old friend. She fills Megan’s days and months, one day’s tasks overflowing into the next. The demands of maintaining the boat and running a business prevent her from keeping a relationship, from pursuing other jobs, from going to graduate school, from making other plans. This is not how she envisioned it. But here it is, a blessing and a burden. An obligation and a gift. The memory is like a dream now. Hasket and Megan spent their first summer together sailing up Maine’s sunken coast. They passed lighthouses, fishing villages, and rocky cliffs, navigating around offshore islands. Their hair curled at the ends in the salty breeze, the air full of sounds of seagulls, lapping water, fluttering sails. North of Monhegan, the boat’s rudder became caught on a lobster buoy. The sea was quiet with no other boats in sight; it was the end of the season, the autumn chill rolling in. Anchored backward to the lobster pot, the seas started coming in, filling the cockpit. Even with the strain of the boat against it, the lobster gear would not let go. Hasket and Megan found a knife from below and fastened it to the gaff. They cut themselves free. As each sailing season closes, Megan reviews the books and reflects. She tells herself she has to be realistic. If she sells the boat, she wants Frances to remain part of the Portland community. Maybe it could be used by a youth sailing organization. She believes Frances is at her best as a teacher, used as a space where the tradition of sailing can be carried on. It’s what Hasket started and always encouraged: a community, a simple community out on the water without distraction or hassle, where nothing trivial matters. Where the crew and vessel are at the mercy of nature but cooperate with her and cooperate with each other. Where there is just sea and salt and the gulls, the jagged oak-ridden coast, the islands emerging at every turn like fingertips reaching up from the earth. Where the Frances is a tiny vessel making passage in a palm. In the winters, Megan goes to sea on other boats, making passages out into the Atlantic. She travels south, leaving Maine’s brown November coast retreating in the distance, but it isn’t always a clean break. Her steps away from the boat are countered by a pull that brings her back. In the days before her most recent trip south, Megan ran into Hasket’s mom at the gas station. She told Megan how much she appreciates all she does to maintain the Frances, to keep the business running, to carry on a dream. She wiped away tears, saying how being on the boat reminds her so much of her son. Out at sea, everything is blue—or saturated in red at sunrise and sunset. There is nothing to see except ocean and sky. Megan is small, a tiny fleck floating on the waves. There’s no coast or bird or island in sight, but she is not afraid. The horizon pulses with the heartbeat of the planet, and she feels it, the water and salt and sky coursing through her veins. She breathes in, her lungs filling with memory. Her heart swells with adventure and life. She is home. Now, in the boatyard, Megan sits alone on Frances’ deck, working to winterize the boat for the season. With needle-nose pliers, she undoes the shackles that were seized in the spring. The shackles are connecting links that hold parts of the boat together, like block pulleys to rigging. It’s a job she and Hasket used to do together each year. As she disassembles, labels, and puts them away, she wonders whose work she is undoing, whose hands were on them last. Someone who came to help on the boat? A deckhand? Wally? Megan herself? The momentum carrying on the seasons flows like a current now, has a pace and rhythm that moves forward. A life continues in so many ways, she thinks, and packs the shackles away. Kelly Shetron is a writer and multimedia storyteller living in New York City. She received her BA in English and economics from Muhlenberg College and studied nonfiction writing and multimedia storytelling at the Salt Institute for Documentary Studies. She wrote this story in 2013. I spend my summers and falls sailing around the islands of Casco Bay, Maine. Nothing makes me more pleased than when fresh ideas of how to purposefully use Frances take form at a season's start. This season's ponderings, though fresh for us, date back to the era of Frances' design. To help you better understand, first I will share a bit about this boat. My name is Megan, I own and captain Frances. The man who dreamt of her was just about the most clever person I think I will ever meet. His name was Hasket, and one of his many visions was to build a replica of a late 1700s sailing vessel. The boat would be named Frances, and launched into the Fore River in 2003. She is a replica of a workboat from 1790, her design utilitarian for the practical purpose of coastal trade and fishing. I loved the Frances even when she was just pencil on paper, all ships curves and calculations. She was a working vessel and yet elegant in her lines. Today you may know her as running day sail and charter trips from the Maine State Pier. I am beyond the point of being able to count the number of times I have set out from the pier and sailed past the islands of Casco Bay. Sometimes we stop, but mostly we sail past. There has always been a bit of me that wants to see Frances do something she would have done in her time. In the years between 1790 and 1820 there would have been fifty or more of these 70-foot range, gaff-rigged topsail cutters on anchor in Portland Harbor. These vessels would sail out to the fishing banks with dories in tow. They traded lumber, salt, granite, and a great number of natural resources along the coast of Maine. We carry visitors, local people, musicians, yogis, summer campers, maybe even you have been aboard. We don't carry cargo... but we could. I am hopeful in saying this season Frances will be working with Fresh Start Farms at Cultivating Community to help organize island delivery of CSA summer farm shares. I am optimistic we will have a good response and we hope to service one, if not three, of the islands in Casco Bay. Peaks, Little Diamond, and Cushing are on the short list. The sale of 10 summer shares per island will allow for weekly delivery by sail. This idea in part stems from spending my childhood summers on an island in Maine. I have memories of the vegetable boat crossing the Sheepscot River, docking on Pratts Island, selling us fresh veg right from the farm. They made the trip once a week, weather permitting. It was rustic, it was old world, it was real, and to a child it was magic. Perfectly ripe tomatoes, candy-striped beets, sugar snap peas, pies, pickles, and luscious local goat cheese rolled with fresh dill. These memories make me nostalgic for island living and for summer. Now I am grown with a boat of my own, and I call a different community home. I believe there can be a connection between soil, farm, food, cargo, and our sailing heritage alive on our working waterfront. Portland is the perfect place for it. Since 2009, Cultivating Community has led the New American Sustainable Agriculture Project, now the largest land-based farmer training program in Maine, to support former refugees, as well as other immigrants, in creating farm businesses. The farmers provide the produce for their CSA and wholesale programs. More information on Cultivating Community and pricing for summer shares may be found at cultivatingcommunity.org A visit to their website is inspiring. It will be an absolute pleasure to get this organization on the water. We will be sailing in June. If you are an islander reading this, perhaps we will be bringing you your fresh veg come July. Please be in touch if this service would be of interest to you, and please share this blog with island friends.